Wooden serving trays, metal chip baskets, table service, and a range of fancy gourmet burgers. A little review of the new McDonald's Gourmet Burger Range, it's the first one ever in Australia and will be in every Mcdonald in Australia. Also Chicken burgers are soon to come to McDonalds. This is filmed at Showground Road, Castle Hill. 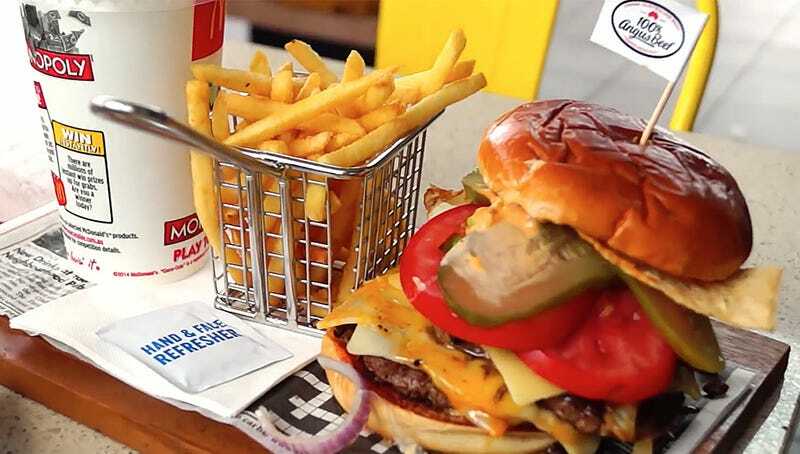 Sadly, it's only in Australia now but, knowing McDonald's history of trying products in one place of the world and then bring it to others, I wouldn't be surprised to see it soon in the US and Europe. Especially in the US, when there seems to be a burger renaissance right now.